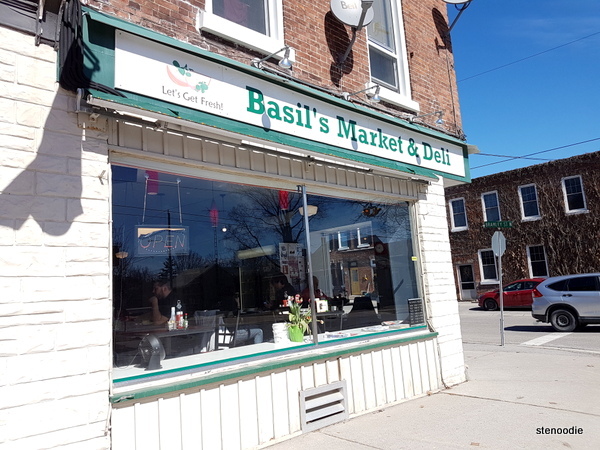 March 17, 2018: After spending the morning at the Ganaraska Forest Centre, we headed to Basil’s Market & Deli at 12:30 p.m. for lunch. 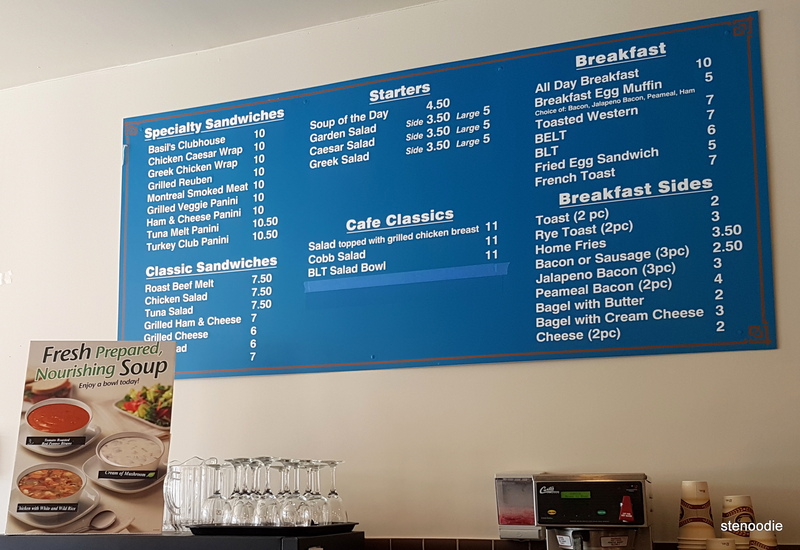 Our reservations were already made for us and when we arrived, we simply chose the items from the menu and any drinks. 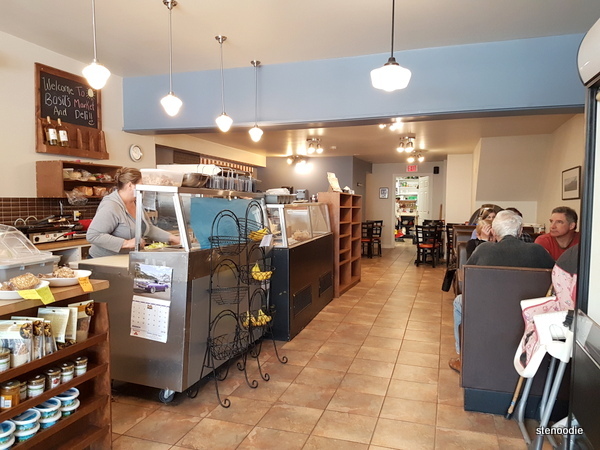 Basil’s Market and Deli (276 Ridout St) was like a corner shop deli sandwich and soup place. 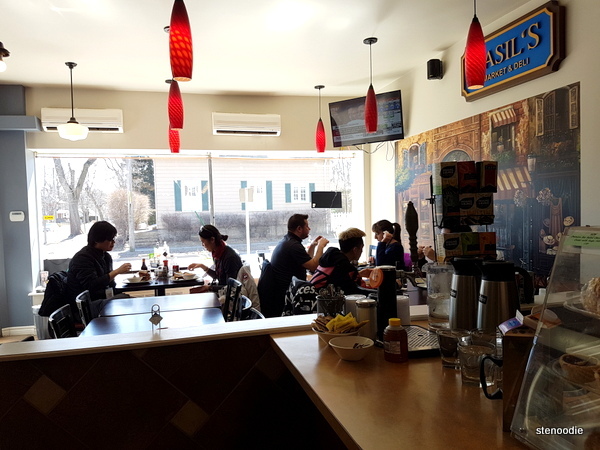 The sun was streaming into the windows so we had a very toasty warm spot to enjoy lunch in. Minutes after placing our order at the counter, our food arrived at our table. 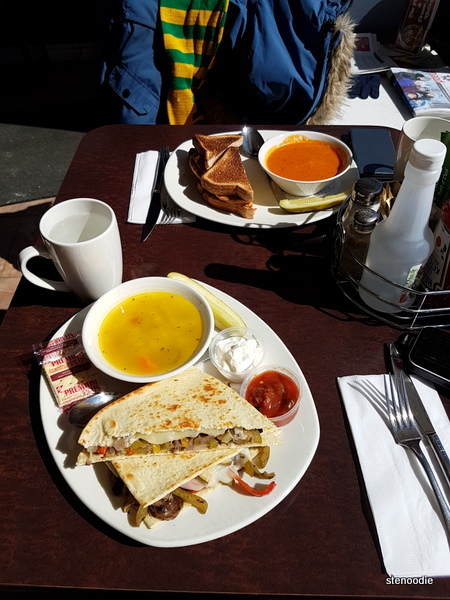 I had ordered a Grilled Veggie Panini with a Chicken and White and Wild Rice Soup. Although they had a huge selection of drinks in their fridge, I was happy with a mug of hot water. 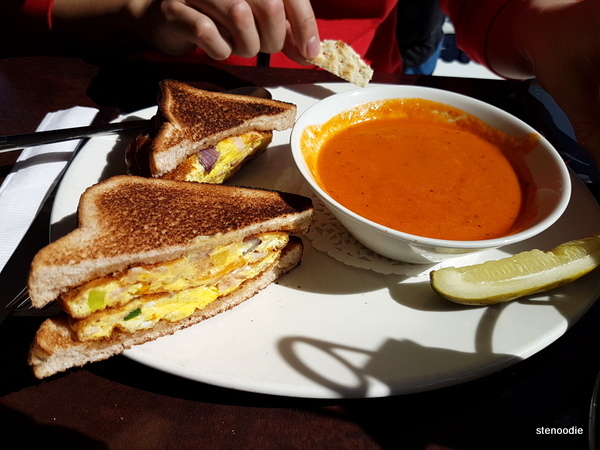 Ken ordered the Western Sandwich with Tomato Soup and hot water as well. 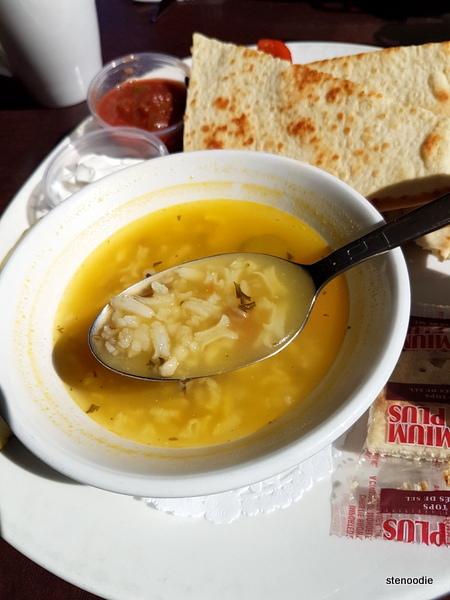 I really liked the Chicken and White and Wild Rice Soup. It was so comforting and I liked the texture of the wild rice in the soup. 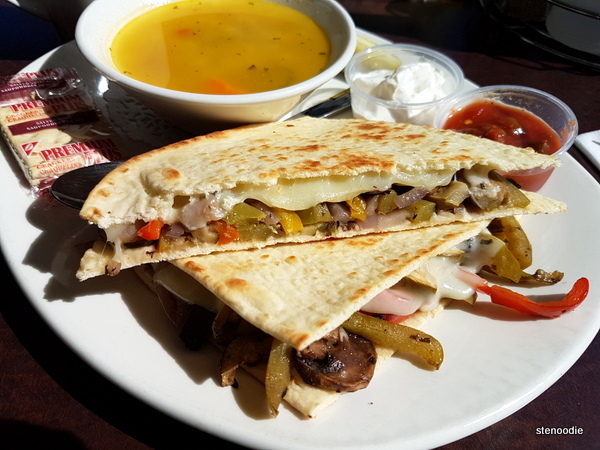 The Grilled Veggie Panini was so good too. It came with sour cream, salsa, and a pickle. I liked that the melted cheese oozed out of the panini. I enjoyed my meal here. 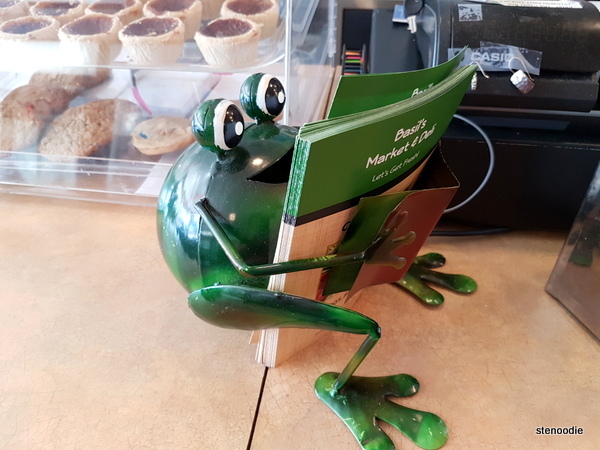 🙂 Thank you, Basil’s Market & Deli, for having us and to the Municipality of Port Hope for sponsoring this lunch. 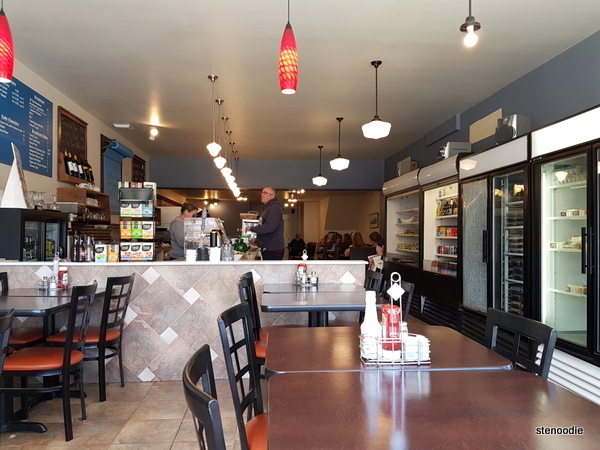 This entry was posted in Complimentary Adventures, Food and tagged #OntariosFAVsmalltown, 276 Ridout St, @porthopeontario twitter, Basil's Market & Deli reviews, Basil's Market and Deli, Basil's Market and Deli menu and prices, Basil's Market Port Hope, breakfast, Chicken and White and Wild Rice Soup, deli restaurant, food blog, foodie, Grilled Veggie Panini, lunch, Port Hope, Port Hope restaurants, restaurant review, Toasted Western, Toasted Western Sandwich, tomato soup, Western Sandwich. Bookmark the permalink.